Activating a new printer, requires entering the unique activation code into Dashboard. 1. While logged into the Voxel8 dashboard, click the “Printers” menu selection (see Picture 001) at the top of the page. Picture 001: Voxel8 Dashboard menu. 2. 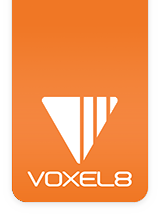 Next, click the “Add Printer” button selection to add your Voxel8 Developer's Kit machine (see Picture 002). Picture 002: Adding a new Printer to the organizational hierarchy. 3. On the Add Printer screen, enter in 6 character long activation code that was displayed when the printer first started in the token form field (see Picture 003). Then click the “Add Printer” button to register it. NOTE: If you have clicked away the activation token, you can find it against in the touchscreen under "Settings->Printer Info". Picture 003: Activating the new printer to the organizational structure. Congrats! Your printer should now be activated and accessible for use. NOTE: Once your printer is added, you can then open the control interface from Dashboard on the "Printers" page to obtain low level control of the printer complementary to the touch panel display.